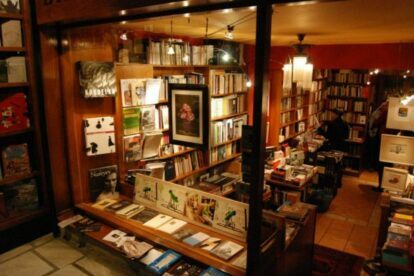 Bookshop Lemoni – My dearest bookstore! I discovered this small bookshop in the spring of 1998. Since then, when I want to buy a book and I have time to spend during my evenings, I always visit Lemoni. But is it not only the kindness of the owners, Spyros & Avgoustinos, which makes customers feel comfortable. You can find really interesting art books, Japanese poetry, novels, mythology, postcards, Moleskines, table books, but you can also have a coffee if you ask for it, and talk with the owners about literature and poetry. In summer, you can enjoy a coffee or a lemonade in the garden where a fat black cat named “Lemonita” is chilling. Usually you can meet new people who are always open to communicate with you while listening to classical music. Also, if you are lucky, you can have the chance to attend a photo exhibition or a poetry night. Lemoni is a bookstore that offers not only books, but also hospitality and tenderness, and I feel it’s a part of my life, like we’ve been growing up together!